Every dog owner has a duty of care to make sure their dog gets a walk daily. Puppies need much less exercise than an adult dog. If you over exercise a growing puppy you can tire it out and damage the developing joints, this can cause early arthritis. The Kennel Club say ‘a good rule of thumb is a ration of five minutes exercise per month of age (up to twice a day) until the puppy is fully grown. ie: 15 minutes (up to twice a day) when the puppy is three months old, 20 minutes when the puppy is four months old etc. Once the puppy is fully grown it can go out for much longer’. It is important that puppies and dogs go out for a daily exercise in a safe and secure area. Time spent in a garden is no substitute for exploring new environments and socialising with other dogs. It is good practice to make sure that your puppy is trained to recall so that you are confident that he will return to you when called. Puppies should never be exercised on a full stomach, this can contribute to bloat. 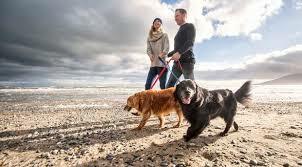 A dogs’ exercise needs vary according to the breed, but every dog should have at least one walk a day, often two. The Kennel Club have a breed information centre on their website and you can use this to find out more about the exercise your dog needs. Walking is essential for your dog’s long term health and fitness, keeping the muscles strong and supple and ensuring that it doesn’t get overweight. It is said that 1/3rd of our pets are estimated to be overweight as a result of their owners’ sedentary lifestyles!. * Take a pedometer with you so that you can measure your steps – you will be surprised. * Always take a poo bag, so that you can dispose safely and cleanly of your dogs mess. 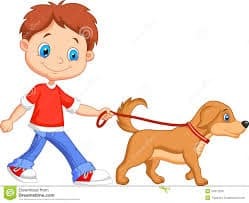 * Take a dog-lead, lots of public places state that the dog must be kept on a lead. * If you loose your dog on a walk contact all local veterinary surgeons/dog wardens, often stray animals get taken to a vet.